Conrad has emerged as major fashion icon of our generation so I love that a part of her iconic look is a retro cat eye. Feeling inspired, I dove head first into the world of eyeliner so I too could master the look. When the liquid eyeliner is out, don’t both asking if I’m going to be ready on time. Through much trial and error, I’ve settled on a few products that work: gel and felt tip eyeliners. The Stila and L’Oreal products have a felt tip so you can easily control the line which I find the hardest part of using a standard liquid eyeliner brush. My hands are too shaky and I could never get a fine line with a brush. The felt tip dispenses the product easily but also allows for a sharp line. I find the Stila liner has a little more staying power but that comes with the price. The L’Oreal liner is a very suitable drugstore alternative. The Maybelline pot and Benefit are both gel liners which give you even more control than the felt tip liner. Gel glides really easily so it’s hard to mess up. It’s also really buildable so you can start with a small line and build it out or up. If you use the Maybelline pot, ditch the brush it comes with ASAP. It’s worthless. Try a pointer liner brush (this is the one I use) or an angled brush. 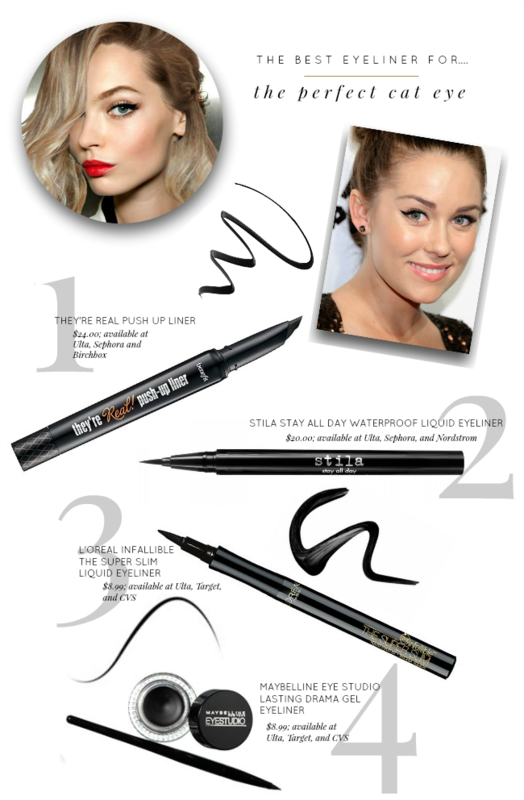 The Benefit liner takes some getting used to but once you get the hang of it, you’ll love how easy it is. You have to squeeze the tip (just for a second, just to see how it feels) to get the product to come out evenly but once it does, it is pretty fool proof. My only qualm with gel liners is they are more matte that I like. I like a shiny cat eye. But for days that I’m looking for something more subtle, the gel liners are great. Hahaha Love this post! I couldn't agree more with your first paragraph :) Love her but still can't believe how young she was when she first started her show. Thanks for the great liner tips as well!